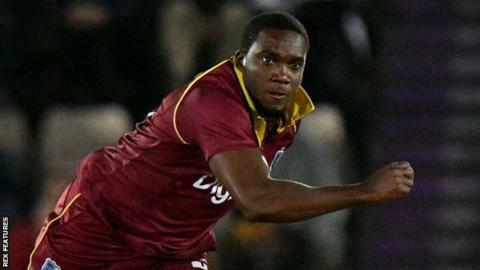 West Indies fast bowler Jerome Taylor has joined Somerset for the remainder of their T20 Blast campaign. The 34-year-old Jamaican has taken 33 wickets in 30 Twenty20 internationals and has also appeared in the Indian and Caribbean Premier Leagues. Taylor is set to make his debut against Surrey at The Oval on 27 July. "We are delighted to have secured such a high-quality player for the business end of the Vitality Blast," Somerset director of cricket Andy Hurry said. "He brings with him a wealth of international T20 experience and is a player who can really impact games with the ball, both with the new ball and especially at the end of an innings." Somerset are currently sixth in the South Division of the T20 Blast, with two wins and two defeats from their four games so far. Taylor had a short spell with Sussex last summer and took a hat-trick against Essex in a One-Day Cup match.